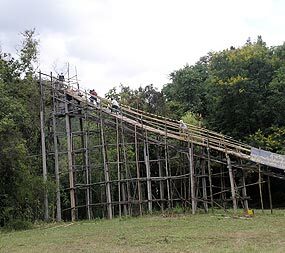 A unique and very noisy provincial festival took place on July 13 at Hay Lan in Mae On district, 40 kilometres from Chiang Mai city. 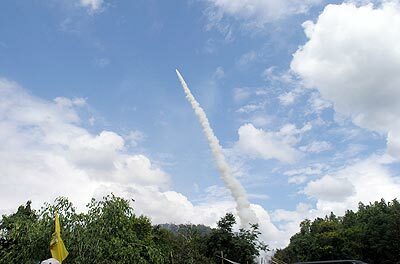 Known as Bun Bang Fai, translated as the Fire Rocket Festival, the celebrations include the launching into the skies, (one at a time), of 95 handmade 50 feet long rockets from temples all around Chiang Mai. The launch pad for the huge rockets. The launching is a form of contest - points are awarded, and whichever temple’s rocket stays up, goes the furthest, and remains in one piece, wins a substantial cash prize. NASA comes to Chiang Mai, indeed! Thousands of people, including the Mayor of Chiang Mai, Dr. Duentemduang na Chiengmai, came from all over the province to join in the celebrations, watch the fun and stay on after the rocket-launching competition ended at 4 pm for the evening concert, another very loud occasion! 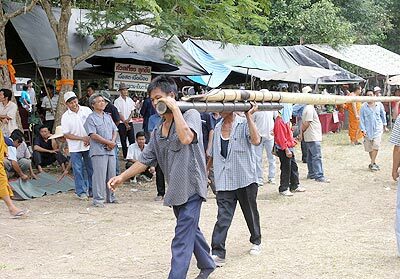 After the festival and rockets were blessed by monks in a short Buddhist ceremony, the fun began. This year, the first two rockets failed to light; but after that it was “all systems go,” as the next rocket set an almost unbeatable record! Inevitably, some rockets exploded without taking off; when a rocket is that size it obviously pays to stand well back when the blue touch paper’s lit! The fourth rocket landed a few metres away from the spectators, causing a commotion, the noise of which was easily drowned by the beating of drums and chanting which, apparently, helps the rockets to at least get off the ground, as does dancing. 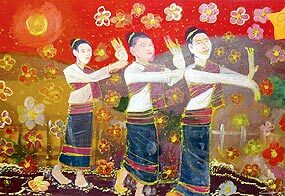 As with the majority of festivals, there is a legend behind the Bun Bang Fai festival. In olden times, it was held in honour of the rain god, a deity known as Vassakan, who apparently loved to be worshipped with fire. Local people would fire rockets into the heavens, beseeching Vassakan to bless them with a good rainy season for rice cultivation. CM Mail’s brave photographer’s close-up pic of one of the rockets. The Shangri-La was the venue for a fabulous pool party and promotion held on the evening of July 10, to which all the GM’s and other representatives of the top Chiang Mai hotels were invited by the Horeca MD, Rudy van der Berg. 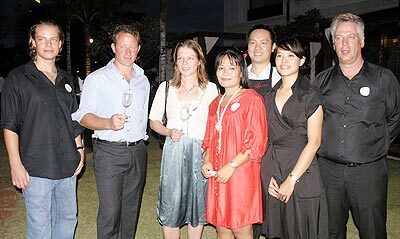 Horeca is one of the major suppliers of wine and spirits to major hotels in northern Thailand. Not a beer belly in sight! 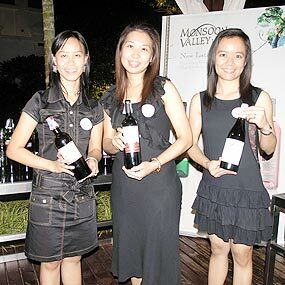 The event was used to promote two single malt whiskies, (Glengoyne and Isle of Arran), Belgian draught beers, (including the famous brands Stella Artois, Leffe, and Hoegaarden) and Monsoon Valley, a wine new to the area. The Belgian beers are already on sale at the “Number One” bar on Loy Kroh Road, and proved very popular at the pool party. With so much alcohol offered and being consumed, the delicious buffet proved just as popular, and included oysters, a wide selection of Japanese food and an extraordinary range of beef. Also popular as a great idea was a prize draw with a difference; instead of keeping the prizes, the winners were encouraged, (and, of course, delighted) to give their prizes to Glenn Croston from Croston House Children’s’ Home. 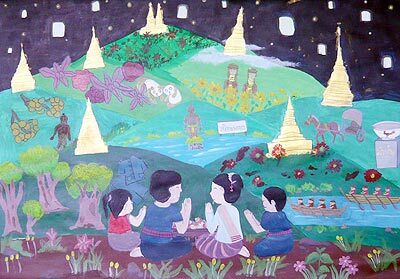 This Thai-registered foundation, located in Makrua sub-district of Lamphun province, currently provides a home for 28 disadvantaged Thai children from various provinces. Accommodation, food and clothing are provided within a family environment and the foundation ensures that the children receive an education. How could anyone refuse a glass of wine? To further entertain their guests, Horeca had arranged musical delights throughout the evening from three top musicians, Jody, Pavel and Drew, who formed the ‘Band for Tonight,’ playing a selection of folk music from across the world. At the end of the evening, after mixing so much grape and grain, guests were encouraged to use a taxi service for their journeys home! For further information on Croston house, please email [email protected] or telephone 086 385 7118. 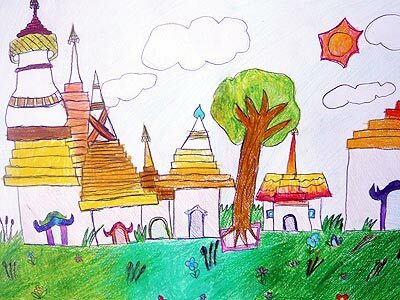 A website, www.crostonhousechildrenshomethailand.org is currently under construction. If you would like to make an event that little bit more special, invite aroundtown @chiangmai-mail.com. (winemaker, Siam Winery), Joon (Horeca), Michael (Pinacle Gastro), Paweena (Brewberry), and Rudy (Horeca). A superb joint birthday bash for both David and for Tananan Willson, Chiang Mai’s very own “haute-couture” designer, took place July 13 at the Empress Hotel, with guests of honour including Dr. Chao Duangduan na Chiengmai and everyone’s favourite hair stylist, Somsak Chalachol. The theme of the party was fancy dress; Tananan’s special request was that guests should come in “drag” - as a result many just couldn’t wait to get their most glamorous frocks on! Regular readers of the Mail will already know classical pianist David, as well as Tananan, both famous in the community as much for their hard work for many local charities over the years as for their design and musical talent. 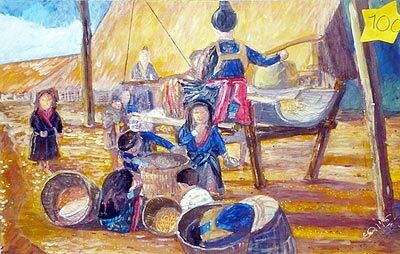 It may surprise readers to know that Tananan wasn’t always a designer - his varied careers include managing his family’s two-generation old massage business, through managing the gourmet cookie part of the enterprise, to working for the United Nations in the fields of drug treatment and health care programs. He also holds a degree in accounting and business administration. Glamorous and adaptable, many of his designs found their inspiration in operas and musicals, and feature drapery and hand embroidery. Although Tananan has now officially “retired,” he still designs privately, for competitions, and provides amazing outfits for charity occasions, such as the recent Soroptimists Chiang Mai’s fundraiser “Taking Action in Style - Fashion Show Extraordinaire,” held in May for the benefit of the Single Mothers Project. He is also the treasurer of the Committee of Public Relations and Marketing Association of Northern Thailand, which in itself supports many local charity organizations in the north. David Wilson is not only an extremely talented musician, he has also influenced and is responsible for encouraging other local talents in their chosen fields. In the news recently has been one such, tenor Antoine Garth - who in return put on an amazing show for David and Tananan at the party. The Chiang Mai Mail would like to take this opportunity to wish both David and Tananan Many Happy Returns - and many more to come. 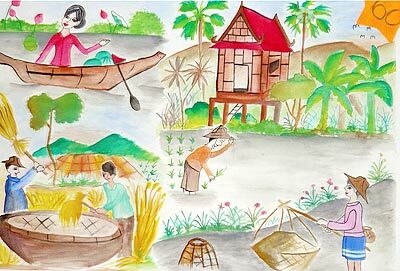 ‘Scenery, Lanna Countryside’ by Sabrina Magnusson from Prem. 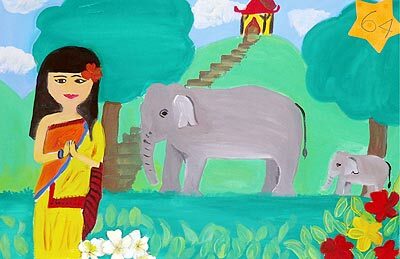 ‘Lanna Land’ by Shay Grivald from Prem. 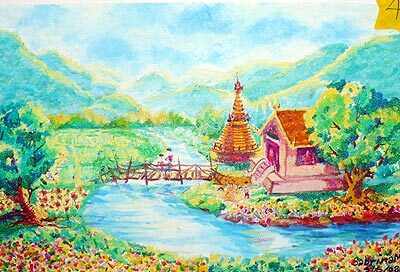 ‘Buddhist Way in Lanna’ by Wanisornkul (Nano) Thantanu from Prem. 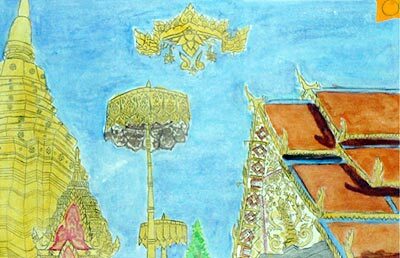 ‘Doi Suthep’ by Kormkana Ramruay from San Payang Wittayakorn. 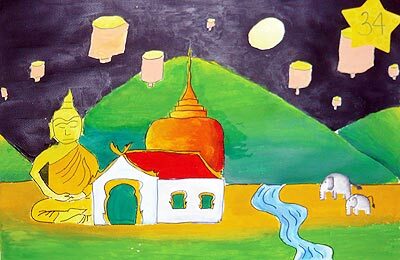 ‘Buddha’ by Budsaba Preeda-aman from Nawattaphume School. 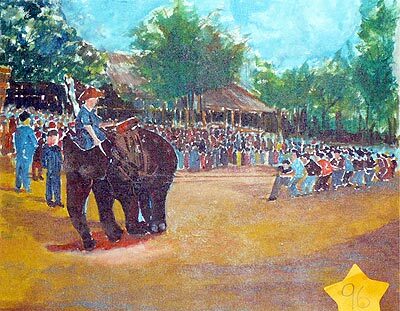 Elephant Tug of War’ by Prapat Hongform from Asia Technology School. 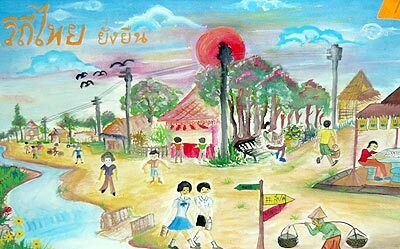 ‘Way of Lanna Thai Life’ by Jam Comoan from San Payang Wittayakorn. Lanna Night’ by Rangsimon Pholcharoenchit from American Pacific. 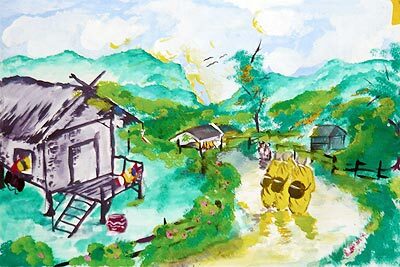 Hmong Life Style’ by Prapat Hongform from Asia Technology School. 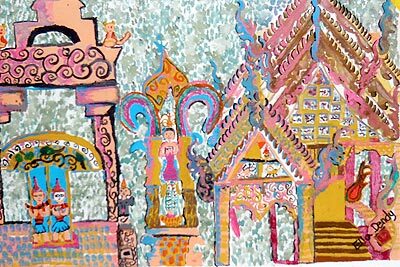 ‘My Lanna Village’ by Subsunsit Manee from San Payang Wittayakorn. Heart of Happy Findings’ by Ella Gabrielle Dendy from N. Payap Int. Delightful Specialities’ by First Kunchan from Prem. 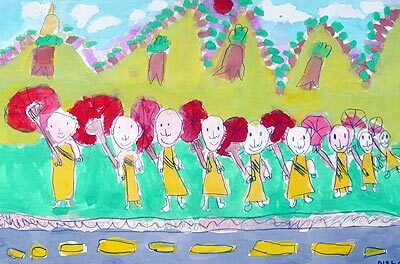 Lanna Flowers Dancing’ by Saradit Puengtham from Asia Technology School.